Businesses they owned, land they had to sell, buildings they had to rent. Newspaper advertisements covered them all. And, The Legal Genealogist is compelled to add, there may be so much more in those newspaper advertising columns. Particularly in the legal advertising columns: with the notices so many of our ancestors were required to post — or have posted to or about them — because of the law. From notices to creditors of an estate that they had a certain time frame within which to file their claims to notices of pending court actions against absent defendants, the legal advertising columns of newspapers large and small, all across America (and beyond! ), were chock full of information the law thought people had a right to know — and no other way to find out. And from a genealogist’s perspective, they are an absolute gold mine. Particularly when it comes to the legal ads, the answer for all of us should be a resounding yes. 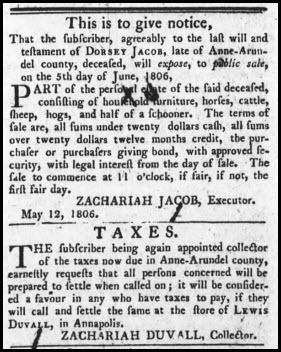 Image: (Annapolis) Maryland Gazette, 8 May 1806, p. 5, col. 3; digital image courtesy of Newspapers.com. So timely! I’m currently doing some fascinating research on a relative who owned a dry goods store in a small town and advertised the business in the local paper. By her mid-20’s in the 1880’s she was part owner of the store! That’s really neat, Blaine, and quite the achievement for a woman of her day! I knew a divorce was granted for my Carner gggrandparents in Medina Co., OH but the index was poorly annotated. So much so that the county clerk couldn’t find it! I had a search of the newspaper done for that all important legal notice. With the date, it wasn’t much trouble to find the case! Their son-in-law had the Wells Fargo concession in Silver City, NM and the wonderful stagecoach ad was a treasure to find. I’m currently looking for the writeups of a court case in Tillamook Co. OR to fill out the store left unsaid by the dry court documents. My list goes on and on…. Nicely done on that bit of research!! This is timely! I just posted an ‘ad’ from a newspaper in 1894 where my ancestor’s brother is praising the effects of Lagrippe Medicine for coughs and colds! I also recently found a legal advertisement in a newspaper that listed 36 of my relatives in the late 1800’s! I didn’t know who all of them were, but I figured it out! So, it was a big help! Glad you’re finding good stuff!! I have read old newspapers and noticed the announcements, legal and otherwise, but never delved into finding any associated with my own family. This is a new avenue of research for me, especially for family members who were boat builders, lumbermen and quarry owners in northern Maine in the 19th century. I will be seeking out those local newspapers! This post will be on my list of Recommended Reads tomorrow at http://www.emptybranchesonthefamilytree.com. Thank you! Thanks for the kind words, and I hope you make some great finds! !